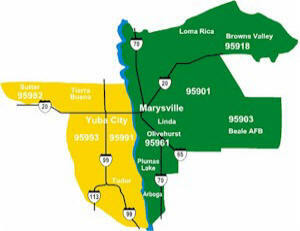 28,632* residential addresses in Yuba City and Sutter. Zip Code Breakdown: 14,835 addresses in 95991 zip (Yuba City, east of Highway 99), and 12,322 addresses in 95993 zip (Yuba City, west of Highway 99), and 1,475 addresses in 95982 zip (Sutter). 23,216* residential addresses in Marysville, Loma Rica, Browns Valley, Beale AFB, Linda, Olivehurst, Plumas Lake and Arboga. Zip Code Breakdown: 12,178 addresses in 95901 zip (Marysville, Loma Rica and Linda), 1,088 addresses in 95918 zip (Browns Valley), 1,059 addresses in 95903 zip (Beale AFB) and 8,891 addresses in 95961 zip (Plumas Lake, Olivehurst and Arboga). *Circulation figures quoted from April 2019 issue. Look for the Shopper logo and click it to download coupons from the radio station websites. to see The Shopper ™! Pre-printed inserts $29 per thousand, maximum weight 0.3 oz. Additional $3 per thousand charge for each 0.1 oz. over 0.3 oz. **Rates include design, layout, two color printing. TERMS: Payment is due on the 17th of the month prior to publication. Bills not paid by the 27th are subject to a $50.00 late charge plus 1-1/2% of the balance each month thereafter (Min. $1.00), which is an annual rate of 18%. Preferred: High Resolution Adobe Acrobat Press Quality PDFs (300 dpi or more). Accepted: Adobe InDesign CS3 or above (fonts converted to outlines), Adobe Illustrator CS3 or above (fonts converted to outlines), Adobe Photoshop CS3 or above (flattened or rasterized). All Images should be 300 dpi at 100%. All full-color pages must be process CMYK (no RGB or spot colors, please). All blacks in text should be C0/M0/Y0/K100. If you are creating a two-color ad, use Red (0/100/100/0) and Black (0/0/0/100) only. We do not accept images off of websites or low resolution (72 dpi) images. or on any bulletin board. The Shopper™ reaches virtually every residential address in seven Yuba-Sutter Zip Codes. It is the most read advertising in the Yuba City-Marysville community. Visit with the Shopper Scholarship Winners! See each of these 2015 2014 2013 2012 2011 2010 2009 2008 Previous Shopper Scholarship Winners! you will need Adobe's FREE reader, click this link! Y-S Tang Soo Do Academy. Copyright © 2016 Buschmann Communications. All rights reserved.